Depending on your experience and preferences, instead of using a prebuilt toolchain, you may want to customize your environment. To set up the system your own way go to section :ref:`get-started-customized-setup`. Once you are done with setting up the toolchain then go to section :ref:`get-started-get-esp-idf`. 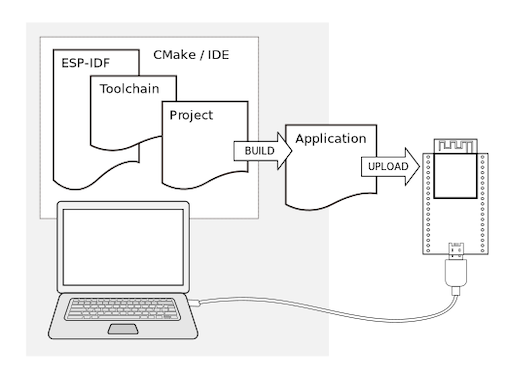 The toolchain programs access ESP-IDF using IDF_PATH environment variable. This variable should be set up on your PC, otherwise projects will not build. Setting may be done manually, each time PC is restarted. Another option is to set up it permanently by defining IDF_PATH in user profile. To do so, follow instructions specific to :ref:`Windows <add-idf_path-to-profile-windows>` , :ref:`Linux and MacOS <add-idf_path-to-profile-linux-macos>` in section :doc:`add-idf_path-to-profile`. Now you are ready to prepare your application for ESP32. To start off quickly, we will use :example:`get-started/hello_world` project from :idf:`examples` directory in IDF. You can also find a range of example projects under the :idf:`examples` directory in ESP-IDF. These example project directories can be copied in the same way as presented above, to begin your own projects. You are almost there. To be able to proceed further, connect ESP32 board to PC, check under what serial port the board is visible and verify if serial communication works. If you are not sure how to do it, check instructions in section :doc:`establish-serial-connection`. Note the port number, as it will be required in the next step. Use Space key, or Y and N keys to enable (Yes) and disable (No) configuration items with checkboxes "[*]"
If you are Arch Linux user, navigate to SDK tool configuration and change the name of Python 2 interpreterfrom python to python2. If there are no issues, at the end of build process, you should see messages describing progress of loading process. Finally, the end module will be reset and "hello_world" application will start. If you'd like to use the Eclipse IDE instead of running make, check out the :doc:`Eclipse guide `. Several lines below, after start up and diagnostic log, you should see "Hello world!" printed out by the application. or monitor fails shortly after upload, your board is likely using 26MHz crystal, while the ESP-IDF assumes default of 40MHz. Exit the monitor, go back to the :ref:`menuconfig `, change :envvar:`CONFIG_ESP32_XTAL_FREQ_SEL` to 26MHz, then :ref:`build and flash ` the application again. This is found under make menuconfig under Component config --> ESP32-specific --> Main XTAL frequency. To execute make flash and make monitor in one go, type make flash monitor. Check section :doc:`IDF Monitor ` for handy shortcuts and more details on using this application. That's all what you need to get started with ESP32! Now you are ready to try some other :idf:`examples`, or go right to developing your own applications. After some time of using ESP-IDF, you may want to update it to take advantage of new features or bug fixes. The simplest way to do so is by deleting existing esp-idf folder and cloning it again, exactly as when doing initial installation described in sections :ref:`get-started-get-esp-idf`. After that remember to :doc:`add-idf_path-to-profile`, so the toolchain scripts know where to find the ESP-IDF in it's release specific location.